Home→PiWire→A video showing Pi-Wire in action! ← Would you like a slice of π? 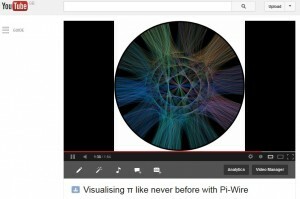 We’ve uploaded a quick video (less than two minutes) which shows off what you’ll see as Pi-Wire generates the visualisation of the first 3141 digits of π.
I’m trying to see about getting a more fitting backing track for the video but even with your computer on mute the video is very pretty!